When the original shipping company Carlos A. Gothong & Company broke up in 1972, one of the successor companies was Carlos A. Gothong Lines Incorporated (CAGLI or Gothong Lines) owned by the scions of the founder Don Carlos A. Gothong. It was eclipsed early by Sulpicio Lines Incorporated which was owned by the once operations manager of the mother company. And then its operation and fleet even got smaller in 1980 when Lorenzo Shipping Corporation of Lorenzo Go and two other siblings went their separate way (this company was later sold to the Magsaysay Shipping Group but later the scions of Lorenzo Go founded the Oceanic Container Lines Incorporated which now has the biggest number of container ships in the country which has the “Ocean” series). Carlos A. Gothong Lines Inc. again became a significant national liner company in the 1990’s when again they built a fleet of liners starting in 1986 and more significantly in 1987 when they acquired the sister ships Our Lady of Fatima and the Our Lady of Lourdes. The sister ships Sto. Nino de Cebu (the later Our Lady of Medjugorje) and the beautiful Our Lady of Sacred Heart, both acquired in 1990 cemented their national liner position and the big liner Our Lady of Akita, acquired in 1993 declared their intention to play in the big leagues. The rising company got absorbed when they acquiesced to the creation of big merged shipping company WG & A (which stood for William, Gothong and Aboitiz) in late 1995 and that included their small fleet of RORO Cargo ships and also their Visayas-Mindanao overnight ferries. In this merged company their main representative to the Board of Directors was Bob Gothong who was close to the Aboitizes and not the eldest Bowen Gothong. While Bob Gothong never veered from the Aboitiz orbit (take note it was Aboitiz Jebsens which was in charge of the operations fleet maintenance of WG & A), the other siblings of Bob Gothong were not satisfied with the state of things in the merged company and in 2001 they asked out and the process of divestment began. Even before the divestment was completed the revived Carlos A. Gothong Lines Incorporated already had the Butuan Bay 1 ready to sail the Manila-Cebu-Nasipit route which was considered lucky for them and where they were very strong in cargo historically. Instead of being paid in ships, the Gothong siblings were paid in cash (while Bob Gothong remained with WG&A) and for this to happen a lot of WG&A ships, both ROPAX and container ships had to be sold to China ship breakers for cash. With the proceeds in the divestment that did not include Bob Gothong, the Gothong siblings led by Bowen Gothong acquired the big Manila Bay 1 and Subic Bay 1 in 2003 and 2004, respectively which were as big as their old Our Lady of Akita which burned in 2000 as the SuperFerry 6. The two was followed by the Ozamis Bay 1, also in 2004 and by the Cagayan Bay 1, the sister ship of SuperFerry 2 and SuperFerry 5, in 2007. At its peak the revived Carlos A. Gothong Lines Incorporated had a total of 5 ROPAXes (RORO-Passenger ships) plus a valuable wharf in the new reclaimed land in Mandaue adjacent the Cebu International Port or Cebu Pier 6. But though they had five ferries, the revived CAGLI was only able to regain a limited presence in the Visayas-Mindanao routes which were once dominated by them together with the Trans-Asia Shipping Lines Incorporated. The revived Gothong Lines did not prove to be very successful. When they re-entered liner shipping, many passengers were already leaving the liners and they were going to the budget airlines and the intermodal buses using short-distance ferry-ROROs. Cargo was also shifting too to the intermodal system because of the high container rates and the hassles of hauling container vans to the Port of Manila from road congestion to criminality and to the rampant mulcting of the so-called “authorities”. In those years it seemed there was a surplus of bottoms which meant excess ships, a possible result of liberalization and incentives programs of President Fidel V. Ramos. Gothong Lines then became notorious for late departures and arrivals because they gave preference to cargo which earns more than carrying passengers and they were actually never strong in the passenger department. Repeated complaints led the maritime authority MARINA (Maritime Industry Authority) to suspend their permit to carry passengers. With that happening Gothong Lines simply converted their ROPAXes into RORO Cargo ships just carrying container vans and vehicles. With weakness in this business too, soon Cagayan Bay 1 and Ozamis Bay 1 soon found themselves laid up in the Gothong wharf in Mandaue and Butuan Bay 1 was sold after an engine explosion and it became the Trans-Asia 5 of Trans-Asia Shipping Lines Incorporated (TASLI). So in the recent years it was only Manila Bay 1 and Subic Bay 1 which were sailing for Gothong Lines and it seemed the two was enough for their limited cargo and routes. However, as RORO Cargo ships they were inefficient because of their big engines. But even then Gothong Lines were offering discounts and cheap rates in general which only showed how overpriced are container rates in the country. Recently, Cagayan Bay 1 and Ozamis Bay 1 were sold to the breakers but their hulls are still in the Gothong wharf in Mandaue as of the writing of this article. Many speculated what will happen next to Gothong Lines with two inefficient and obsolescent ships and some were even asking if they will soon cease operations as their two ships were already clearly old and might even be too big for their routes. For me, I always look at their wharf which they retained and I know it is very valuable in terms of market value. Actually, the container shipping company established by their brother Bob Gothong, the Gothong Southern Shipping Lines Incorporated (GSSLI) does not even have an equivalent although it is the more progressive and booming company. Recently, two RORO Cargo ships arrived in the Gothong wharf one after another and they were still relatively new by Philippine standards. These are the Panglao Bay 1 and the Dapitan Bay 1 and from the look of things they are the replacements of Subic Bay 1 and Manila Bay 1. Actually, some three months ago as of the writing of this article, the Subic Bay 1 was already pulled by tugs and it seems here destination is a ship breaker somewhere in South Asia. That happened when the Panglao Bay 1 was already sailing for them. It is speculated that the Manila Bay 1 will be disposed of when Dapitan Bay 1 will already be sailing. In reality, it is possible she already has a buyer now. 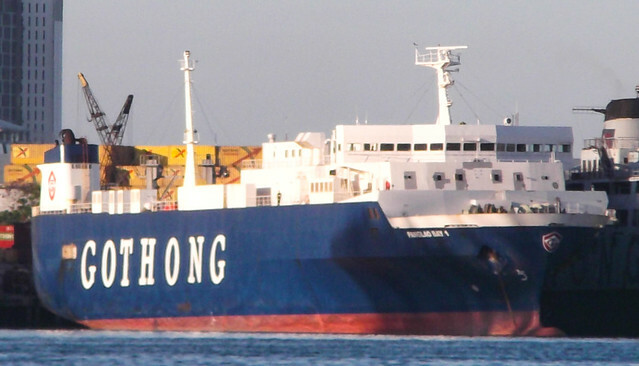 The Panglao Bay 1 was built in 1995 and her external dimensions are 128 meters by 22 meters with a Gross Tonnage (GT) of 5,930 in cubic volume and a cargo capacity of 4,946 tons in Deadweight Tonnage (DWT). Meanwhile, the Dapitan Bay 1 is officially a Vehicle Carrier and was built in 1992 and has the external dimensions 145 meters by 21 meters and has a cubic volume of 7,073 tons in GT and a DWT of 4,485 tons. This ship has different specifications depending on the maritime database. Whatever, these two ships are already the ships of Gothong Lines for the future and they look like worthy replacements for the Subic Bay 1 and Manila Bay 1 though they are a little smaller (but the engines are smaller too which is a plus). But then Gothong Lines might have already studied their cargo capacity needs and concluded that the sizes of the two fits them just right. And so Carlos A. Gothong Lines Inc. is still fighting back. That is good news as they are the bearer of one of the most storied names in Philippine shipping history. When Sulpicio Lines acquired big (by local standards) RORO Cargo ships in the late 1990’s and early 2000’s, I thought they were hoarding some ships that can be later converted in ROPAX (RORO-Passenger) ships in the mold of what Carlos A. Gothong Lines Inc. (CAGLI) did when they were able to come up with the beautiful Our Lady of Sacred Heart and the Our Lady of Medjugorje which were former RORO Cargo ships in Japan (and none would have thought that were their origins) and sister ships. I do not know what truly were their plans but if that was their intention then events soon overtook them when in the new millennium the bottom fell out of passenger liner shipping when budget airlines and the intermodal buses and trucks drew away passengers and cargo from the liners. This was shown when passenger capacities of the newly-fielded liners went down in the new millennium to 2,000 from 3,000 plus before and “carferries” that came had their two cargo decks just retained. The RORO Cargo ships of Sulpicio Lines I am talking about were the ships known as Sulpicio Express Uno, Sulpicio Express Dos and Sulpicio Express Tres. The three, if compared to the sister ships of CAGLI which went to WG&A were a little bigger and a little faster although all were single-engined which is the mark of cargo ships including RORO Cargo ships. If they have been converted into ROPAX ships they would have been as big as SuperFerry 1, SuperFerry 2 and SuperFerry 5 although a little slower. The first of the three to come here was the Sulpicio Express Uno which arrived in 1997. This ship was the former Hokuto in Japan and she was built by Shin Yamamoto Shipbuilding in Kochi yard, Japan in 1980 with the ID IMO 8005733. Hokuto measured 129.9 meters by 20.0 meters with an original gross register tonnage of 4,176 tons and she had a service speed of 17 knots. This RORO Cargo ship has a bridge at the front and cargo ramps at the quarter-bow and at the quarter-stern, all features that will be very good had she been converted into a ROPAX ship. The second of the three to come here was the Sulpicio Express Dos which arrived here five years later in 2002. This ship was known as the Hokuo Maru in Japan and she was built by Shin Kurushima Hiroshima Dockyard Company in Akitsu, Japan in 1988 with the ID IMO 8817265. Her external measurements were 136.0 meters by 20.0 meters with a gross tonnage of 4,433 with a service speed too of 17 knots. She too had a bridge at the front with a cargo ramps at the quarter-bow and at the stern. She looks much like the Sulpicio Express Uno in the superstructure. With the same breadth I even wonder if she and Sulpicio Express Uno were actually sister ships. Even the placements of their ramps were the same. The last of the three RORO Cargo ships of Sulpicio Lines to come was the Sulpicio Express Tres which also came in 2002. This ship was known as the Honshu Maru in Japan and she was built by Imabari Zosen in Imabari yard, Japan in 1989 with the ID IMO 8817071. She measured 128.5 meters by 20.4 meters and her gross tonnage was 4,695 and she had a service speed of 17 knots too. The ship also had a quarter-bow ramp and a stern ramp. Her difference though from the other two RORO Cargo ships of Sulpicio Lines was in having the bridge amidship. A position of the bridge amidship was not really a disqualification if she was intended for conversion into a ROPAX ship as shown by some local examples here like the Butuan Bay 1 of CAGLI although it might look a little ungainly. The three were almost of the same size and they had the same service speeds coming from single engines that average 10,000 horsepower which is a little bigger than the engines of the CAGLI sister ships. As built, all had two car decks. If converted all could have had one single cargo deck and three passenger decks with probably a passenger capacity of about 1,500. Like the CAGLI sister ships they might have had a service speed here of 16 knots or maybe a little better. They will be little slower than most big liners then but still acceptable and comparable to some of the newer but slower liners like the SuperFerry 3 of Aboitiz Shipping Corporation and the San Paolo of Negros Navigation Company. Well, the service speed here of Our Lady of Sacred Heart and Our Lady of Medjugorje was also 16 knots so that was acceptable. One intriguing comparison I saw was with the Ozamis Bay 1, also of CAGLI. This former RORO Cargo ship that was converted into a ROPAX ship has external measurements of 130.3 meters by 20.0 meters with an original gross register tonnage of 4,545 tons which are almost the same as the three Sulpicio Expresses. I even wonder if she was a sister ship of Sulpicio Express Uno and Sulpicio Express Dos. However, her bridge was amidship and she was not converted beautifully. Hence, she did not look good and her passenger capacity was small at 601 persons. However, since she had 13,400 horsepower on tap she had a higher design speed at 19.5 knots. The three Sulpicio Express ships were not converted into ROPAX ships and so they just served as RORO Cargo ships and doing what a container is doing except that she takes in container vans RORO (Roll on, Roll Off) in trailers compared to the LOLO (Lift On, Lift Off) method of the regular container ships. The three were in the container van trade and were never used to take in vehicles that were crossing the islands. But being faster the three really deserved a new series in Sulpicio Lines that is apart from the old Sulpicio Container (Sulcon) series of cargo ships. In such method of carrying container vans, the three RORO Cargo ships became inefficient compared to the regular container ships. One, using trailers which are called “chassis” in the trade is additional investment and expense (and that also includes the trailer caddies). Second, unlike the regular container ships the RORO Cargo system of stowage takes more space as the container vans can’t be stacked one atop the other with no space in between the container vans. The loading and unloading might have been faster but all types of container ships here don’t really rush from port to port. Moreover, the engine sizes of the RORO Cargo ships are significantly larger than the regular container ships for the same length. They might have been faster but as mentioned before they don’t really rush as having enough cargo really takes time because there are simply too many bottoms. So the speed advantage is just negated. When they were not converted into ROPAX ships, I was even wondering what was the reason Sulpicio Lines kept them for too long, in my view. Well, of course, Sulpicio Lines has no penchant for selling ships and especially to the breakers for as long as it still has economic value. Their only consolation then was they had the fastest cargo ships hereabouts (before the arrival of the faster RORO Cargo ships of Asian Marine Transport Corporation or AMTC). Two of the three still passed to the new name of Sulpicio Lines, the Philippine Span Asia Carrier Corporation (PSACC) where the Sulpicio Express Dos became the Span Asia 15 and the Sulpicio Express Tres became the Span Asia 16 in 2013. The three was a good view when they are in port or near the port. They were bigger than the regular container ships, they were taller and they look different and even their long cargo ramps seem to be an attraction. Maybe a few even had in their minds that the superstructure is near that of a ROPAX ship (and they were not wrong). When Sulpicio Lines began selling their passenger ships in the aftermath of the sinking of their Princess of the Stars and began buying container ships in their place, I somehow felt that the three RORO Cargo ship will also go somewhere down the line. With the size of the new container ships of Sulpicio Lines, it was obvious they were going for efficiency. They were no longer competing for the biggest or the fastest like before. Some container ships of Oceanic Container Lines were even bigger than theirs. In October of 2013, the oldest of the three, which had already reports of engine trouble, the Sulpicio Express Uno was beached and broken up in in the ship-breaking capital of the world which is Alang, India. Then, in November of 2015, the Sulpicio Express Dos and Sulpicio Express Tres were broken up in Chittagong, Bangladesh. The two did not even reach 30 years of age and there were not yet reports of engine troubles from them. Sulpicio Lines just wanted to change ships for more efficiency and they had to go, sadly. Now, the new Philippine Span Asia Carrier Corporation (PSACC), the new name of Sulpicio Lines doesn’t have a RORO Cargo ship anymore. All they operate and all they have now are smaller container ships that are just fit for the container demand on them. Sad to see the three go.